The XA model was the first completely designed and built in Australia. 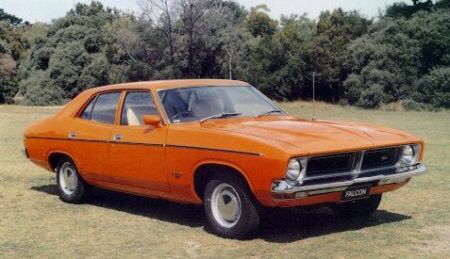 By the time it was released, the U.S. version had been discontinued some 18 months earlier, and the designers had the opportunity of styling a more ‘Australianised’ car. The result was a swoopy, coke bottle design, sleek but featuring a bigger, more roomy body and available with a wider choice of engines and a longer list of options. And, after a break of seven years, Ford introduced a two door hardtop version based on the sedan but with a lower roofline and wider rear wings. 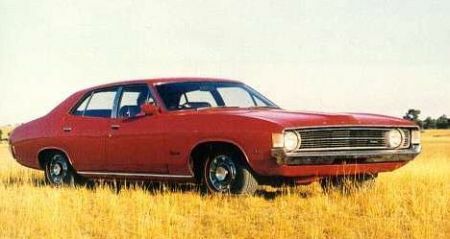 Marketed under the ‘Born on the Wind’ slogan, the XA was a great success for Ford of Australia and a confident statement of its independence. The XA was manufactured between March, 1972 and September, 1973. 129,473 were produced. The XB featured a slight restyle of the previous model, featuring a cleaner but more aggressive front end with a forward sloping bonnet and a wide set, ‘egg-crate’ split grille. The design was very reminiscent of the 1971-73 U.S. Mustang. The tail lamps were also neatened. Many mechanical enhancements were made including the introduction of optional four wheel disk brakes, and the fitting of locally manufactured 302ci (4.9litre) and 351ci (5.8litre) Cleveland V8s. The hardtop continued to be offered, but sales were disappointing while the XB as a whole was the most popular Falcon yet. The XB was manufactured between September, 1973 and July, 1976. 211,971 were produced. The XC was a further re-style of the third generation Falcon. The refined look was achieved by reducing the slope of the grille and introducing large rectangular headlamps on some models. The bonnet line was softened and more substantial bumpers fitted. The coke bottle effect was reduced by altering the style line running through the rear doors. The hardtop still struggled to sell, and Ford introduced the limited edition Cobra as the last of the two door version, and, as a sign of the times, there never was a GT version of the XC. Mid way through the life of the XC, Ford made some radical improvements to the car’s suspension to allow for radial tyres, and these models tend to be known as the ‘XC and a half’. 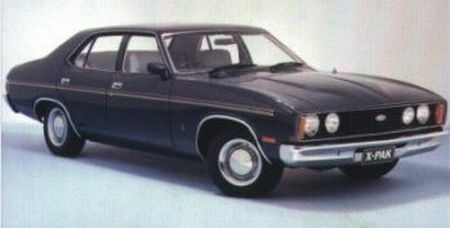 The later XCs are easily identified by the introduction of the the classic Ford oval badge on the centre of the grille, its first use on an Australian Ford. The XC was manufactured between July, 1976 and March, 1979. 171,082 were produced.